In addition to its universal equinoctial dial, this instrument has calendrical tables and a lunar volvelle with an aspectarium. The compass needed to orient the dial in use has a hand-coloured compass card printed from an engraved plate. The instrument's cover is in the form of a ring to enable the compass to be seen even when the instrument is closed. 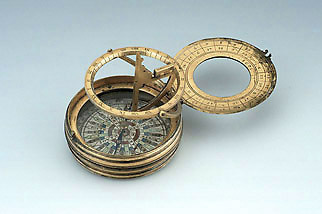 This compact design of equinoctial dial was used by a number of English makers of the early 17th century.